Putting together a book willy nilly won’t get you the book sales you’re looking for. What you don’t know is which parts of a book are actually necessary in your book. And let me tell you, getting this wrong can make you look like a real amateur instead of a credible professional—which is what you actually want. Knowing which parts of a book to include in yours and which don’t make any sense starts with knowing what they are to begin with. Parts of a book make up the entirety of the book, including the title, introduction, body, conclusion, and back cover. In order to write a book book in full, you need to have all the moving parts to make it not only good but also effective. Without essential pieces, your book will appear unprofessional and worse: you’ll lose the credibility and authority writing a book is so useful for. It’s not enough to just write and self-publish a book by throwing it up on Amazon or any other publishing site. You have to get the parts of your book right if you want it to sell more, get those 5-star reviews, and place you as an authority figure in your field. But that’s not all that’s important to your book. The title page is also necessary and without it, your book will be missing something crucial. Your title page serves as a means of not only declaring your title clearly, but also ensuring your name, subtitle, endorsement, and any other crucial information is present for your readers to view clearly. As you can see, the title page is really just the main title, any subtitle you may have, and the author’s name as the bottom. Other than this being an industry standard for books, it helps to keep everything clear without the obstruction of any title images. Your book needs to be copyrighted. Unless you’re okay with others stealing its content and reaping the rewards for themselves, that is. We have a great guide on what it takes to copyright a book right here for you to view, but here are some of the basics. Technically a book is copyrighted as you write it. But if you want it to be fully legal, you do have to pay to have it copyrighted. Your copyright content will change depending on the type of book you’re writing. There are a lot of reasons to have a table of contents in your book. For one, it helps readers know where to find the information they’re really looking for. Secondly, this is highly useful in kindle or ebook versions of your book in order to help readers click and navigate without having to actually arrow over through the pages in order to get there. The happier the reader, the better the reviews they leave. A table of contents is a list of a book’s chapters or sections with the heading name and often the page number if there are no links inside. This is the part of a book that most of us write long before the actual book is finished…we just tend to jot it down in our minds instead of on paper. Your book dedication is like your acceptance speech when given an award. Except your book is the award and therefore, you get to write this “speech” and place it where everyone can read it before even starting the book. This dedicated often comes after the title page and before the table of contents. It’s a short few sentences thanking whomever helped you get to the point of writing the book or just people you want to acknowledge as thanks. If you’re looking to increase your credibility, get a book endorsement by someone who knows you and your story well, then a foreword is what you want. A foreword is an introduction to a book written by someone other than the author that lends credibility to the author’s status to write the book. Think of a foreword as a sort of endorsement of the book. The person who writes it is usually an author themselves, though they can also just be a person of authority in the same or similar field. Above is an example of a foreword from The Go-Giver by Bob Burg. Forewords typically come after the table of contents and before the introduction or first chapter of the book. Fiction is where prologues live. Oftentimes, stories may need additional context before the actual story begins in order for the reader to make sense of it and elements within the book itself. A prologue is a short chapter that usually takes place before the main story begins as a means of granting understanding to the reader. It’s also used to increase intrigue and captivate readers. Not all books require prologues and in fact, if you can write your novel without it, that’s actually preferred as many readers skip the prologue altogether. 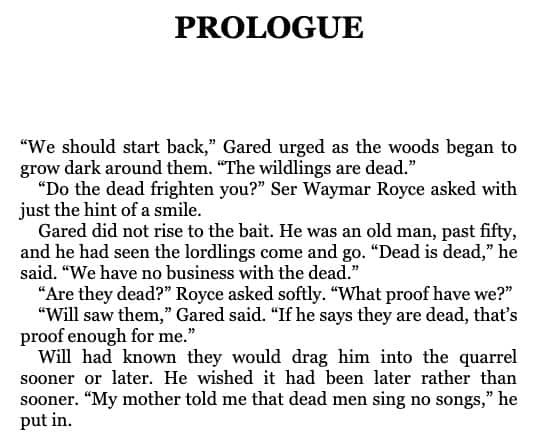 Below is an example of a prologue from the very popular Game of Thrones by George R.R. Martin. Not all book series get happily-ever-after endings. When your book series ends but you want a way to let the readers know what’s in store for the characters’ futures, an epilogue is a strong way to do that. An epilogue is a short chapter that comes after the last chapter of a book as a way to tie the story together in a conclusion. Sometimes the ending of the story isn’t satisfying enough for readers. That part of their story may end, but if your readers want a more in-depth look at their life “after” the story, that’s when an epilogue would come into play to tie everything together. Epigraphs aren’t necessarily important, nor are they required. Oftentimes, these short snippets serve as a way to let readers know what lesson or subject will be covered in the chapter. An epigraph is a short question, quote, or even a poem at the beginning of a chapter meant to indicate the chapter’s theme or focus. This often ties the current work to predecessors with similar ideas and learnings. For example, below is an epigraph from The 7 Habits of Highly Effective People by Stephen R. Covey. Most nonfiction books include an introduction to the book—a chapter before your first chapter as a means to introduce yourself and your credibility or author on the subject matter to your readers. Your book introduction is extremely important for showing your readers why they should read the book and how you’re the person to help them with whatever problem your book solves. One of the best ways to do this is to first establish the pain points your book helps to solve, and then make it clear how you, someone they don’t know, can help with this issue. This usually involves some of your own backstory, but keep it specific to the problem at hand. Your readers don’t need an entire rundown of your personal history. If you’re writing fiction, you may have come across the term “inciting incident” before. This is an early part of a book that’s the point of no return for your characters. The inciting incident is what kicks your plot into full drive. These are all points in the novel that the characters cannot come back from. In this instance, their lives are changed forever, which drive the plot forward. This will mostly pertain to nonfiction authors, we we’ll cover the fiction equivalent in the next section. Some nonfiction books are written with different parts. These are usually separated into 3 parts that make up a greater whole in the book. For example, in the book I’m currently writing, I break it up into 3 separate sections. Each part has its own focus and theme but they all work with one another to achieve a greater purpose. Each part of this book has a main focus and theme but when utilized together, they form a solution to a larger problem. In fiction, instead of creating separate sections like in the example above, you may split your work into different acts. Most commonly used is the three act structure. 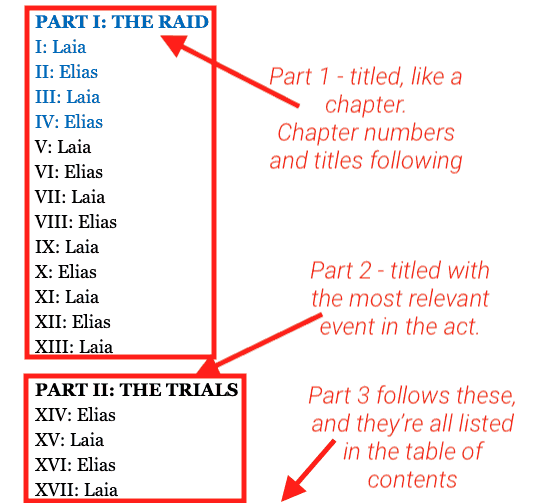 Although this isn’t required of novels, it’s still quite popular to write a book with this structure, as it forms a cohesive order of events that’s proven to be intriguing to readers. A popular example of this 3 act structure is in Sabaa Tahir’s An Ember in the Ashes, featured below. If you’re familiar with our lingo around how to write a novel, or you’re a student already, you may have heard of the first and second slap. These are pivotal points in your character’s journey that further the plot and often make their efforts more difficult. The first slap is often the biggest setback for your character following the inciting incident. All of these have one thing in common: they make the lives harder for the characters. Like the first slap, the second slap is a pivotal point in the novel where your character faces a downfall, most often after having a win or two under their belt since the first slap. The second slap needs to be placed shortly after your readers have gained hope in your character’s ability to succeed in whatever their goal is. The idea behind this is to hook your readers again and let them know that it is not all smooth sailing for your characters throughout the rest of the book. Oftentimes, the second slap is worse than the first, where 90% of your character’s hope in succeeding is lost and therefore, your readers will lose hope too. This makes them root for your character even more, increasing the amount they care for your character. We all know the climax of the book is the most important part. It’s where your character faces the biggest obstacle in achieving their goal in the book. The climax is the last challenge before the ending, or resolution, of your book. It is the point of the highest tension and it’s where your character faces the worst odds—worse than the first and second slaps. We all have people in our lives to acknowledge for our success in writing a book. Much like the dedication, the acknowledgements are meant to recognize impactful people in our lives. These, unlike the dedication, typically come at the end of the book and can be written in longer, paragraph form as a pose to a short sentence for each. Not all books contain an author bio in it, specifically fiction (unless it’s a hardback copy). Nonfiction, however, is a type where the author bio can be at the bottom of the back page of your book, beneath the back cover synopsis. Here’s an example of an author bio for Omer Dylan Redden’s Life Doc. Your author bio doesn’t have to be very long. Keep it short and simple while still showing your readers your credibility in what your book covers. This part of a book might not matter to you unless you have a book series or multiple books to your name. The coming soon and read more pages are used to help your readers purchase and read more of your books. This section of a book often comes at the very end, after your epilogue and acknowledgments. It’s a single page with the cover images of your other book/s, their titles, and links for your ebook copy. This not only makes it easier for your readers to buy the next book, but it’s also a great way to sell more books overall. I saved the best (and most important) for last. The back cover, also known as the synopsis of your book, is by far the most critical for getting people to buy. Without a good synopsis to hook readers and buy them into your book, you won’t sell. These are crucial for both fiction and nonfiction. With your fiction synopsis, you want to create intrigue and show your readers that they’ll get a good story. The trick is doing this with a few short paragraphs. As you can see, these look very different, though they serve the same purpose. The back of your book is the first thing someone reads in order to decide if they want to buy your book. Make it concise, convincing, and show them the value they’ll get from reading it—be that an entertaining read or a solution to their problem. Which parts of a book is yours missing? Are you clear on what your book needs to make it fit these guidelines?